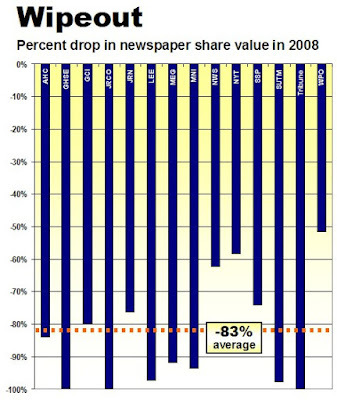 In the worst year in history for publishers, newspaper shares dropped an average of 83.3% in 2008, wiping out $64.5 billion in market value in just 12 months. Although things were tough for all sorts of businesses in the face of the worst economic slump since the 1930s, the decline among the newspaper shares last year was more than twice as deep as the 38.5% drop suffered by the Standard and Poor’s average of 500 stocks. :: The shares of eight of the 14 publishers tracked in the survey fell by 90% or more. The best-performing companies were the Washington Post Co., New York Times Co., and News Corp., but WaPo, the least battered issue of all, still fell 51.5%. :: While market capitalization surpassed $1 billion for all but one of the 13 publishers that were publicly traded at the end of 2004, only four publishers today are valued at $1 billion or more. The New York Times Co. is barely clinging to the distinction. A drop of as just a few cents per share would knock NYT out of the increasingly exclusive billion-dollar bracket. :: The biggest loser of all was Tribune Co., which is worthless as the result of the bankruptcy filed less than 12 months after Sam Zell bought its shares for $8.2 billion to take the company private. :: Trading for pennies, the shares of GateHouse Media, Journal Register Co. Lee Enterprises and Sun-Times Media Group are essentially worthless. GHSE, JRCO and SUTM all were banished to the Pink Sheets earlier this year when their shares fell below the rule at the New York Stock Exchange that prohibits an issue from closing below $1 per share for 30 days in a row. :: At least two more publishers may be destined for the Pink Sheets early in 2009. Unless LEE’s shares turn around within a matter of days, it is likely to be the fourth newspaper stock booted off the Big Board. After falling below $1 per share in mid-December and failing to recover, McClatchy may not be far behind. 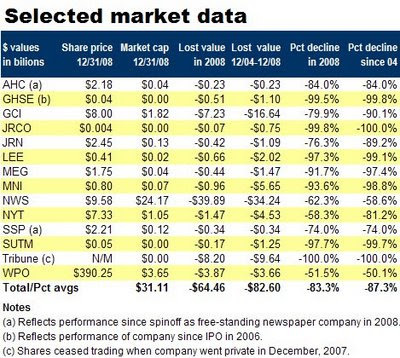 It is fair to surmise that newspaper stocks last year got trounced twice as badly as the broader market , because investors have not seen any plausible strategies from publishers to reverse the accelerating declines in readership, advertising and profitability that have been under way since 2006. As if that were not bad enough, a number of publishers are staggering under the heavy debt they acquired in recent years to fund acquisitions that might have proven to be wise, if the newspaper industry had been able to replicate the steady growth in sales and profits that they largely had enjoyed in the decades since World War II. But times changed, newspapers didn’t and investors lost faith in the long-term viability of the industry. Good thing I didn't rely on my Scripps stock (a decent performer, as the industry goes) and instead had a diversified portfolio of bank and energy shares. This survey comes as no surprise. Here you have an industry that refuses to modernize and catch up with the trends of the day, and a population that has passed it by to go with something new and exciting. Readers have fled, advertisers have fled, and now Wall Street investors have fled. But if you read their comments, the old guard is refusing to adopt anything but cosmetic changes, and is predicting everyone will come back once the economy recovers. Wake up, execs: the bell is tolling, and it is tolling for thee. I do not understand why large institutional shareholders are permitting the management of these companies to remain in place. I do not reward employees for repeatedly demonstrating incompetence, despite being given the best tools the company has to get their jobs done; but, that's exactly what is happening at each of these comapnies. Why is the market adopting such a laissez-faire approach? The traditional spelling is good riddance. If not for daily newspaper reporting, bloggers would lose a lot of their ammunition. So, good riddance and good luck! I’m not sure “good riddens” is the best way to describe what we’ll be losing once our local community newspapers are gone. Believe me it will not be the NY Times or the Wall Street Journal that disappear first. It will be your home town newspaper. In most cases the only people watching our local governments. Do you honesty believe everything you read on the internet now will still be there once these newspapers are gone? I know when someone reads about my small county (175,000) on the internet you can bet the story came from the local newspaper. Once these small time newspapers go under who is going to provide that coverage? Who will attend the local school board meetings? Who will review the local elections? That’s right…People like you are not interested in the local community anymore, which is the real problem this country faces, not how many trees we cut down? Actually, it is big city dailies which are struggling more than community papers, which are still doing quite well. Here in Ontario, for example, Metroland (the community newspaper division of the Toronto Star) is keeping TorStar afloat, while Osprey (the community newspaper outfit recently purchased by SunMedia, parent of the Toronto Sun) is keeping SunMedia going. "I do not understand why large institutional shareholders are permitting the management of these companies to remain in place..."
I think the answer is something like the following. You only take over a company and fire a management team when you have 1) your own management team to replace them with and 2) you think the trouble will be worth your time. Which of these newspaper management teams is any good? Which one would be your replacement? And when you got done, you'd still be stuck in the same dying industry. "...Why is the market adopting such a laissez-faire approach?" Because one of the principles of a market economy is free choice. You can't make me invest in newspapers (unless you are the government and I am a taxpayer). Rimrat and Anonymous are both right. We don't have the same amount of money to invest in technology as does the Morning News. Since we don't, and never really did, and our local owner is about as clueless as any big chain's ownership, we're hurting. At the same time, I'm old enough that like Gary Kamiya (excellent article on Salon today), I really am not interested in looking at a bunch of video feeds online; except for some documentary programs, I've never turned to TV for news except for the most iconic video images.